Jump in with both feet! 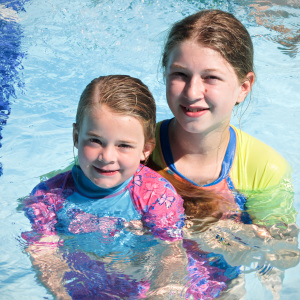 From open to lap swim, lessons to aquacise our aquatics program caters to people of all ages and abilities. 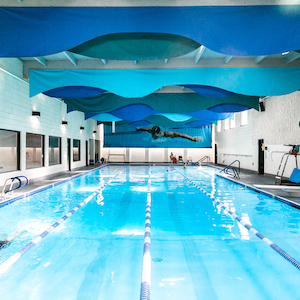 Plus our professional staff, instructors, and life guards are dedicated to giving you the best possible swim experience. Got salt? 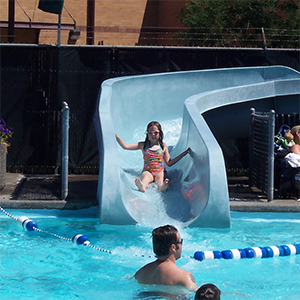 Did you know that we use a “salt” system to provide sanitation for all of our pools. This process provides soft clean water without itchy skin, eye irritation, or bleached swim suits. If you haven’t been in a “salt” water pool before, you will notice and appreciate the difference right away. Pool schedules change periodically. Click here for the latest schedule or stop by the Front Desk for more information. 96 ft long and 4 lanes wide. 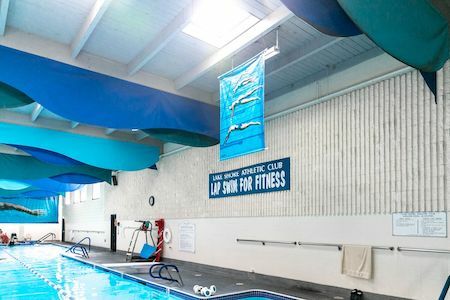 Lap swimming, swim lessons, and open swim are available in this pool year round. 82 ft long, 4 lanes wide, 83 degrees. 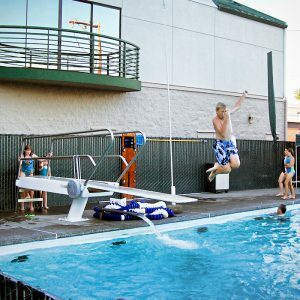 Spring board diving board, 105 ft long water slide. Pool side snack bar is open for lunch daily. Chaise lounges surround the pool deck and a grassy area with picnic tables is available. We’d love the opportunity to show you our facilities with the unequalled fitness choices we can offer you. Tours are available on a drop-in basis during business hours. If you would like to set up an appointment, simply click below and one of our staff members will contact you to set up an appointment for a tour and receive a complimentary guess pass. To speak to one of our staff members, call (360) 574-1991. 40 ft long , starts at 6 inches and goes to 2 ft deep. 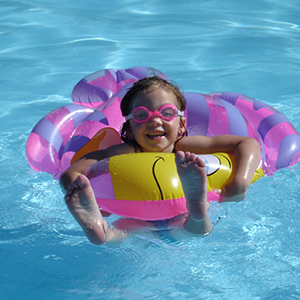 This pool is specially designed for infants through children six years old. We have been instructing children and adults for 50 years with over 155,000 lessons taught. We pride ourselves on our top notch aquatics program. Our seasoned instructors have over 180 years of teaching experience combined. We teach using the Red Cross water safety guidelines. Group and private lessons are available year round from babies through adults. Lessons are open to members and non-members. 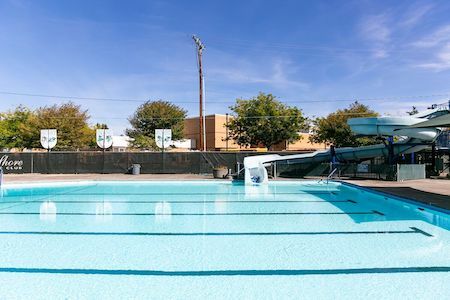 Dive lessons are offered in the Outdoor pool in the summer. 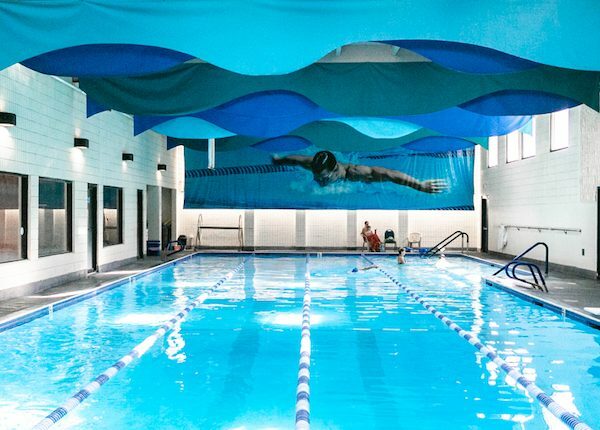 We offer over 10 hours of lap swim time throughout the morning, afternoon, and evening. Lanes are divided by fast, medium, slow, and recreational. 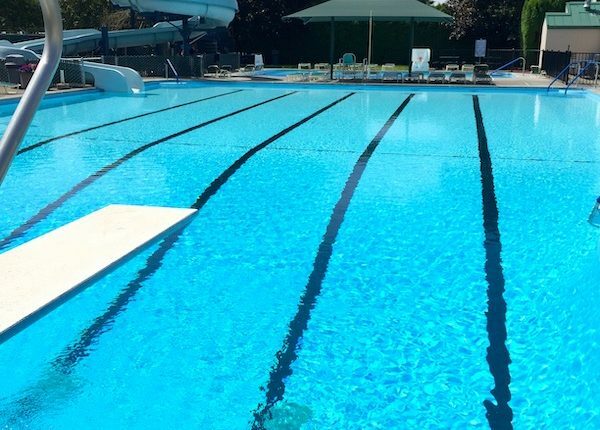 Members are encouraged to circle swim. 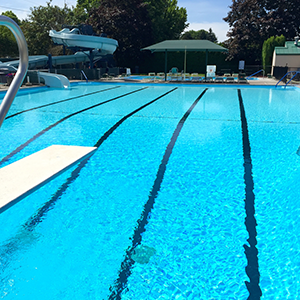 Kickboards, pull buoys, and hydro fit equipment are available on the pool deck for member use. 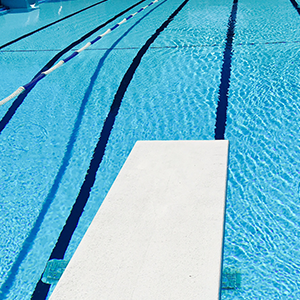 A master’s style swim group meets in the pool on Monday evenings for a weekly workout. 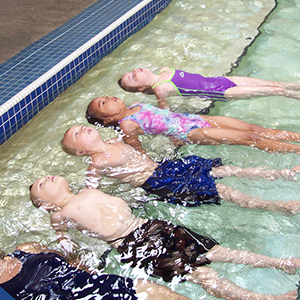 We offer over 15 aqua classes each week. Classes are taught by certified instructors. 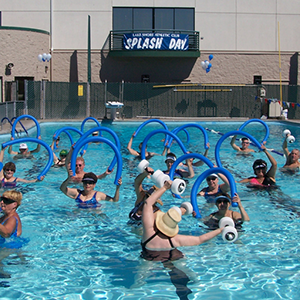 These are taught in shallow water and utilized the water for non-weight bearing exercise. 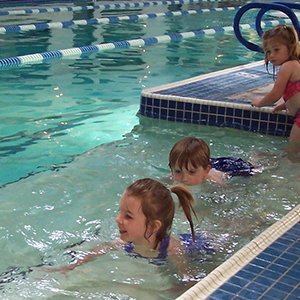 Open swim is available for children of all ages. 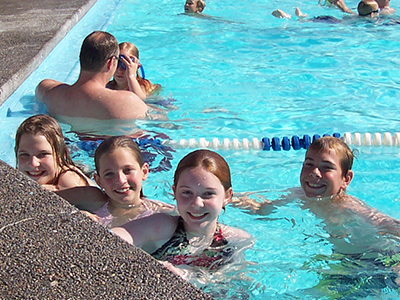 Certified lifeguards are on duty during open swim times.